Usually fall in the Pacific Northwest means cool nights, warm afternoons and plenty of fall color flashing against bright blue skies. I hoped our beautiful summer would lead to another perfect season but this year has been anything but typical and now one of the wettest October’s on record has washed away the colors before I could get out and appreciate my favorite trees. Last week this tree’s green canopy covered the corner of the Trader Joe’s parking lot but here we are, just a few days later and it’s almost bare. Is it a silver birch or something similar? I love them too as they are so delicate. You have captured some beautiful light. I’m glad you like it, M-R! Lisa, I really like the stark quality; it foreshadows winter. The tree is a sweeping example of how we are simply observers of Mother Nature’s charming ways. Happy Photo Challenge. 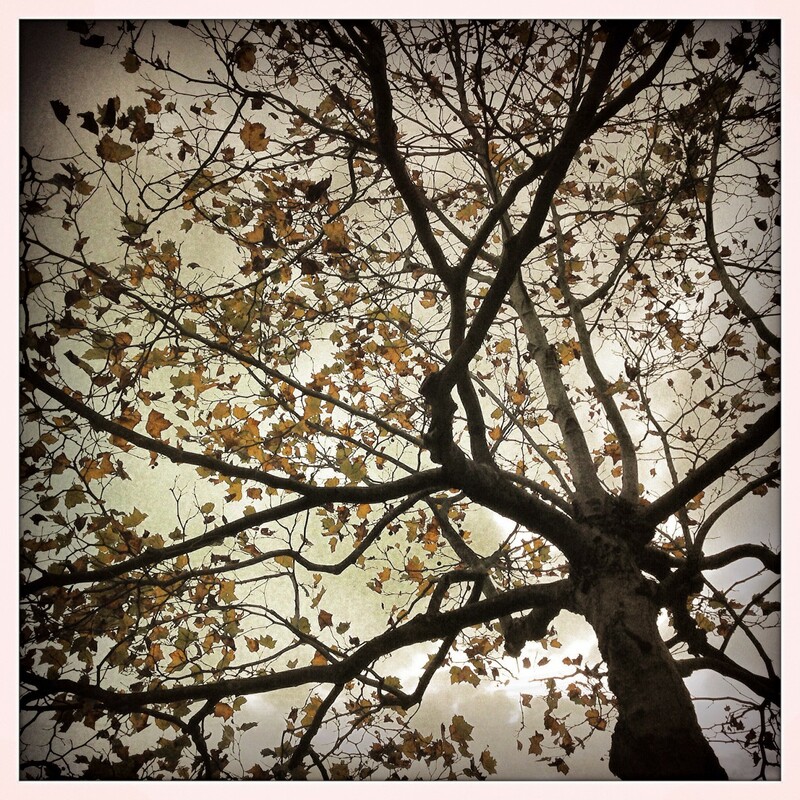 This is a beautiful shot of the tree and leaves, Lisa! Thanks, Amy it’s always so nice to hear you like a photo here! Great to hear you enjoy fall, Rose! Thanks, Evelyn you’ve described it perfectly. Lisa, you point out a good reason to take a photo when you have the chance, as it may never look like that again (at least for another year.) I like the angle of your shot. I always love these kinds of shots angled up into the tree branches. Very beautiful. Wow, Amy thanks so much for such a great comment! Your visits are always a treat for me and it’s a great feeling to know you enjoy my photos. There’s a lovely soft light about that. It reminds me of a silk scarf. Good for photographs but Autumn does can so look sad and gloomy sometimes. Sounds like we were able to appreciate the beauty of autumn a littLe longer in central Ontario. However, rainfall was quite heavy for us too. Love the angle of your photo, beautiful shot. Thanks so much for your nice visits and comments, Teresa. The sun is returning here tomorrow but it’s going to feel like winter… brr! A remarkable photograph… I found it very poetic and ethereal somehow. Thanks so much, Aquileana. 🙂 Have a wonderful evening.